A forearm crutch that incorporates sensor technology to monitor whether it is being used correctly has been developed by engineers at Southampton University. 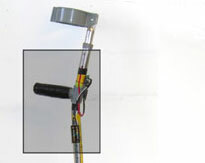 The crutch, which was developed by Prof Neil White and Dr Geoff Merrett at the university’s School of Electronics and Computer Science in conjunction with Georgina Hallett, a physiotherapist at Southampton General Hospital, is fitted with three accelerometers. These detect movement and contain force sensors that measure the weight being applied to a patient’s leg and the position of his or her hand on the grip. Hallett added: ‘These crutches will make it much easier for patients to be taught how to use them properly, and how much weight they are allowed to put through their injured leg. At the moment, the crutch is suitable for monitoring and training patients in hospital environments, but the researchers have plans to develop a pair for use in patients’ homes. Seems like a great patient training aid. Please consider the fact that many patients fail to return crutches to the hospital when their injury has healed. The electronics will only add to the cost of the crutch, so don’t assume hospitals will buy too many for patients to take home with them. Any efforts for renting/ leasing/ selling them will be another unwelcome non-clinical task for the physio department to perform.